September 24th in Premium Themes, Themes for Businesses by Wordpress Jedi . These days a lot of people are losing their jobs through no fault of their own. If your company goes out of your business or files for chapter 11, you shouldn’t expect to stick around. So how do you find a job in these tough economic times? If you have skills that are in demand, you are not going to have to too much trouble finding a consulting gig. Consulting business is very flexible and provides you with your own hours. But before you can get your consulting business, you are going to need a website to promote your business. It’s OK to rely on phone calls and direct contacts to land your consulting gig, but if you plan to stay in the business for a while, you need to start building assets, and your website is going to be one important asset. Consultant Theme is a simple, clean premium theme that is designed for those who want to get their own consulting site up and running fast. The theme is designed for folks who don’t want to spend too much money on a WordPress theme and are not interested in writing too much code before going live. The theme is flexible enough to be customized easily. But you can always just upload your information and go live under 20 minutes. The theme is very easy to use, and you’d be surprised how much you can accomplish with this theme is a short period of time. You can easily upload your picture at the top of the theme. You can also show case your work or sponsors on your sidebar. If you are a consultant, you’ve got to have a presence on Twitter and other social media sites as well. Thanks to this theme, you can display your top social media profiles on your site. I do encourage every consultant to upload your best work to your consulting website to make the best impression on your visitors. Without a website, you are going to lose a whole lot of good leads. 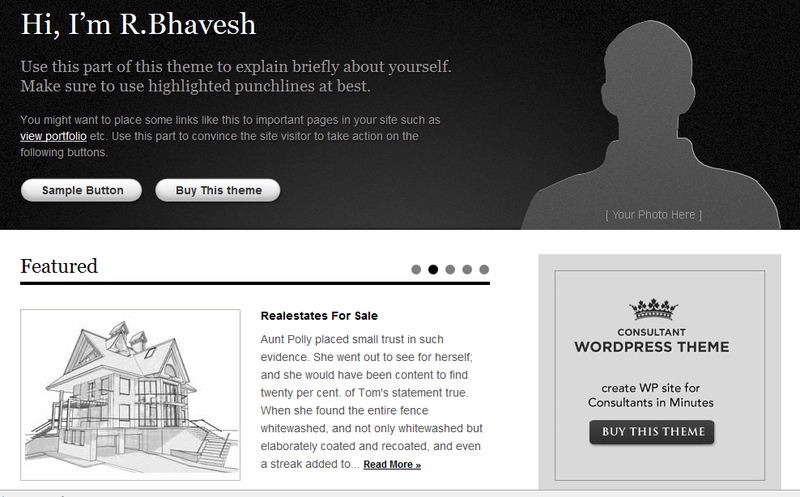 But this theme allows you to go live with your consulting site fast. It’s easily customizable and very clean. The 5 color schemes are a big plus. Overall, a great way to showcase your work and testimonials and generate more leads.